I'm risking bragging about my son's birth here, but there are no gushing bodily fluids in this story. I'm talking about him birthing a product. 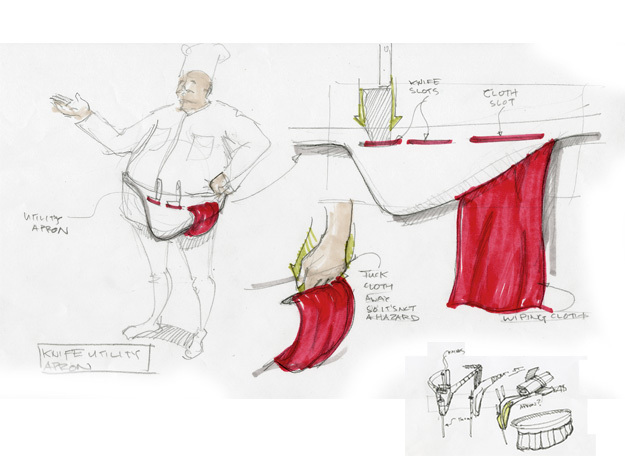 He's an industrial design student and was part of a three-person team to develop a Chef's backpack. The team's design process was nicely depicted and discussed on the hip design site, Core77 and --WOW!...Wired magazine just wrote a nice review too. But here is the one actual "mom story" part. I happened to visit my son the weekend his team was constructing the first backpack prototype. It required a lot of pattern making and sewing. I am a pretty skilled seamstress and I would have been slayed by the amount of work ahead of these completely unaware students. I started to hyperventilate in the design studio (it was Sunday afternoon, and the project was due the next day). When I repeatedly offered to help and started rolling up my sleeves, my son kindly escorted me to the door to "make it to the airport nice and early." Later he told me, "You know how you were saying that our professors assigned a ridiculous deadline on this massive project? At Carnegie Mellon we don't think like that. We just get the job done." I was impressed. At the University of Michigan we might have held a sit-in and organized a Design Students Union with cards and membership dues. Yvonne, Thanks for the Grommet submission...we will definitely take a listen. In the meantime, be sure to ask Benjamin a question or shoot him a comment, on today's Talk About This Grommet.